Touch-based technology isn't just for the iPhone and iPad. Apple's iPhone and iPad are not the only things that work with a touch of the finger. Touch-based technology is finding its way into everything from laptops to printers to once-forgettable desktop PCs--some of which fill critical niches for the smaller enterprise. 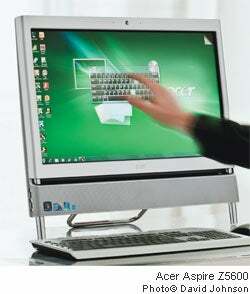 Take the Acer Aspire Z5600, a 23-inch all-in-one touch-enabled desktop PC. The unit packs a hefty 2.33GHz processor, as much as 8GB of RAM and a full terabyte (1000GB) of storage in a single silver enclosure. Reminiscent of the Apple iMac in appearance, the Aspire Z5600's functions can be operated with either a traditional keyboard and mouse or your--or your customer's--fingers. That opens the box to myriad business possibilities: For example, the PC, which retails for $999, could be set up as a low-cost informational kiosk in retail shops or offices. John Karabian, a product manager at Acer, said touch-enabled desktops are being used as data entry points where customers can order food or view high-end cosmetics options at a retail store. And for all of its marketing prowess, Apple is far from being today's top end of touch: Windows 7 has touch technology built into its core operating system, and third-party software vendors are lining up to offer value-added tools for touch. "The iPad and Apple are only the beginning," says Francois Jenneau, sales and business development director for Stantum, a European multitouch display application developer. "Customers now want to touch their data. There is no going back."